Uncontested, Mrs. Doha El Zein Halawi ‘81 was elected president of the Alumni Association Board on October 25. She assumed her role for a three-year tenure as of November 1st, following Mrs. Leila Al Saleeby Dagher ‘60, who had occupied the position for two consecutive terms and who dedicated a great part of her life devotedly serving LAU in a variety of diverse posts. 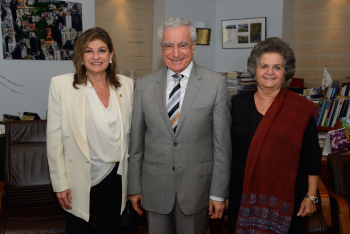 The handing over was celebrated on December 5, 2014 in a ceremony at Dr. Jabbra’s office in the presence of the alumni association vice president and treasurer, as well as presidents of chapters in Lebanon.